My latest kickstarter campaign, to publish a biography of JP Martin, creator of UNCLE, is now live! If you’re able to back this new kickstarter, thank you very much – we’ve already hit our goal, but the more support I get now, the more copies I can print for the bookshops. And apologies if you’ve already backed, or have had this email more than once. I am, of course, already on it like stink on Beaver Hateman. I really never though I’d see this happen, but The Complete Uncle really looks like it’s going to get published. For the last few weeks, I’ve been working on UncleWiki, a wiki about the Uncle books, by J. P. Martin. It’s a very rough framework right now, but I’m adding content as I go. Please join in! I think Uncle stuck with me because of its combination of excess, gadgetry and eccentricity – all of which are modes of being I have attempted to emulate in my adult life. I blame J.P. Martin. — Will Self on the Uncle books, from the Telegraph’s Unsung Books. Guardian Unlimited: Arts blog – books: The elephant not in the room: what happened to Uncle? Author scrussPosted on 02007-06-20 02007-06-20 Categories unclestuffTags book, guardian, uncleLeave a comment on Guardian Unlimited: Arts blog – books: The elephant not in the room: what happened to Uncle? w00t! New edition of Uncle, by J.P. Martin to be published June 2007! Tony Bannister writes in liontower that James Currey gave him some tapes of J P Martin reading some of his Uncle stories. He hopes to restore the tapes and release a CD. Author scrussPosted on 02006-03-05 02006-03-05 Categories General, unclestuffTags art, cd, ice, tape, tories, tv, UK, uncle, voiceLeave a comment on J P Martin Speaks! 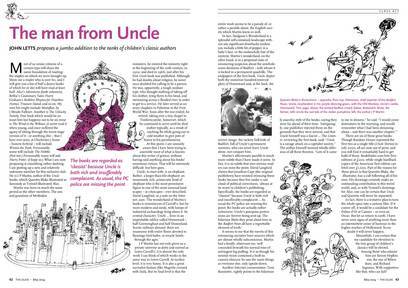 Liontower member Gideon Rachman has written a nice piece on Uncle in this week’s Economist: Whatever Happened To Uncle? Goodman spent all night chasing rats and mice, and yet in the morning seemed perfectly fit and full of good spirits. Soon after breakfast the melodious sound of Ira Smoothy’s motor-bike horn was heard outside and Smoothy stamped in. He was a short, immensely broad man, with thick hair brushed up and large horn-rimmed glasses. Happily General Boar always had breakfast in bed, so they could get straight to the point. My favourite elephant got a good writeup in The Oldie, a magazine I’m not quite old enough to read. The PDF of the full May 2004 issue is currently online if you wish to read it.